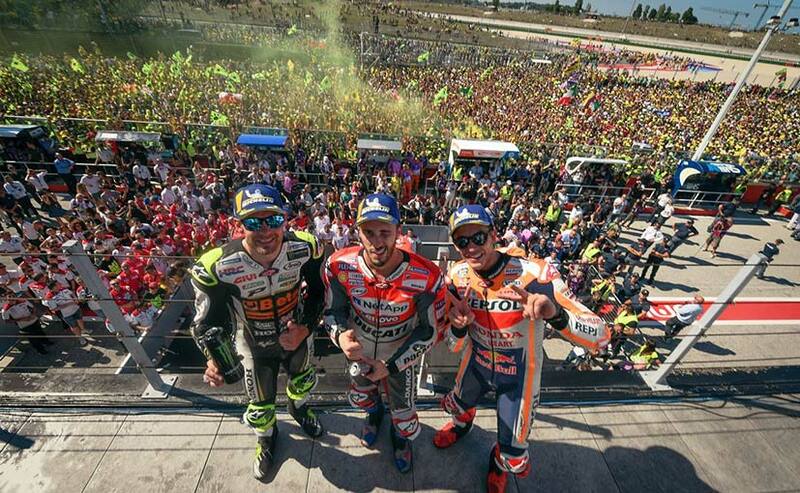 Andrea Dovizioso won the 2018 MotoGP San Marino GP at Misano taking Ducati's third consecutive win of the season, as teammate Jorge Lorenzo crashed out of second. Ducati's Andrea Dovizioso took a hard fought win in the 2018 MotoGP San Marino Grand Prix at Misano, beating teammate Jorge Lorenzo to the chequered flag. Lorenzo, who started on pole crashed out of second place promoting the close running Marc Marquez of Honda to P2, whle LCR Honda's Cal Crutchlow took the final position on the podium. With the San Marino GP, Dovizioso scored Ducati's third consecutive win since 2008. The win has also promoted Dovi to second in the championship standings with a lead over three points over Valentino Rossi. The Italian GP started with Lorenzo on pole and the Ducati rider even managed to hold on to the lead on the opening lap. Dovizioso, however, had an incredible start and was quick to pass front row riders Jack Miller, Marquez and Yamaha's Maverick Vinales to jump into second from fourth place on the grid. Marquez was quick to move into P3 from behind Miller and the trio soon set the pace for the rest of the race. Dovi though was getting increasingly comfortable at the front extending his gap from the rest of the field. Dovi was now breathing down his teammate's neck to take the lead and managed to do so on Lap 6 of 27. 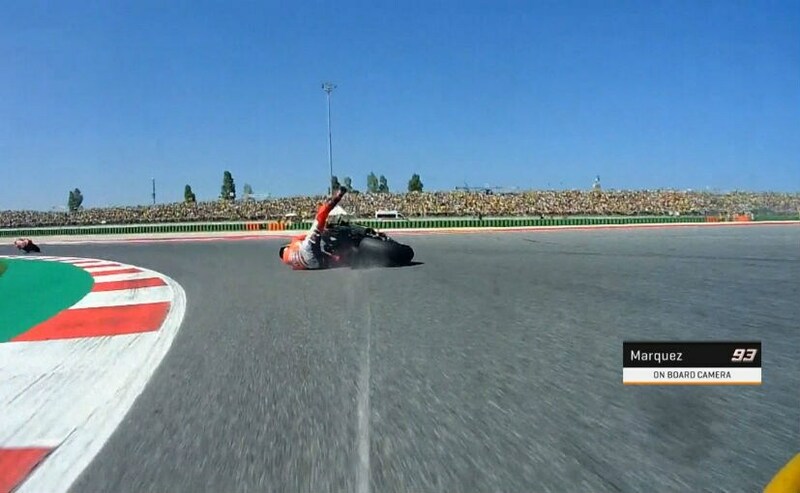 But Lorenzo wasn't letting go off easily and was soon defending his position against an aggressive Marquez. Meanwhile, Miller crashed out of fourth to put any pressure on the Honda rider and Crutchlow was at a distance to really make an impact. Dovizioso led by a gap of one second at the end of Lap 10, which extended to nearly two seconds by Lap 15 over Lorenzo. The real battle though was for P2 between Marquez and Lorenzo with both riders truly in their elements in the final five laps. 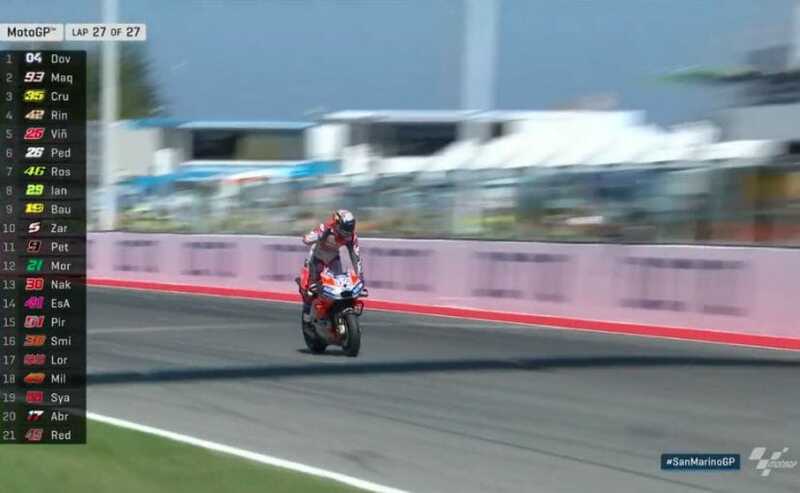 It seemed Ducati would take a 1-2 win today, but disaster struck Lorenzo on the penultimate lap as he crashed on Turn 8. With Doviizioso in the clear, Marquez moved up to P2 and Crutchlow into P3. Dovi won the race with a lead of 2.8 seconds over Marquez. Coming in fourth was Alex Rins of Suzuki over 14 seconds off the race leader, while Vinales couldn't do better than fifth after slipping in the spot on the opening lap. Honda's Dani Pedrosa brought in points finishing sixth, ahead of Valentino Rossi who didn't have brilliant luck in his home race. Taking the final spots on the top 10 list were Suzuki's Andrea Iannone, Alvaro Bautista of Nieto Ducati and Johann Zarco of Tech 3 Yamaha. Danilo Petrucci finished 11th despite a 1.1 second penalty for corner-cutting, while Marc VDS Honda's Franco Morbidelli finished 12th. LCR's Takaaki Nakagami finished 13th, ahead of Aleix Espargaro of Aprilia and wild carty entry Michele Pirro of Ducati. Lorenzo finished 17th in the race after remounting behind KTM's Bradley Smith and ahead of Jack Miller. Retirements in the 2018 San Marino GP included Avintia Ducati's Xavier Simeon Honda's Stefan Bradl, both facing crashes. While KTM rider Pol Espargaro was forced to retire at a little after half distance.